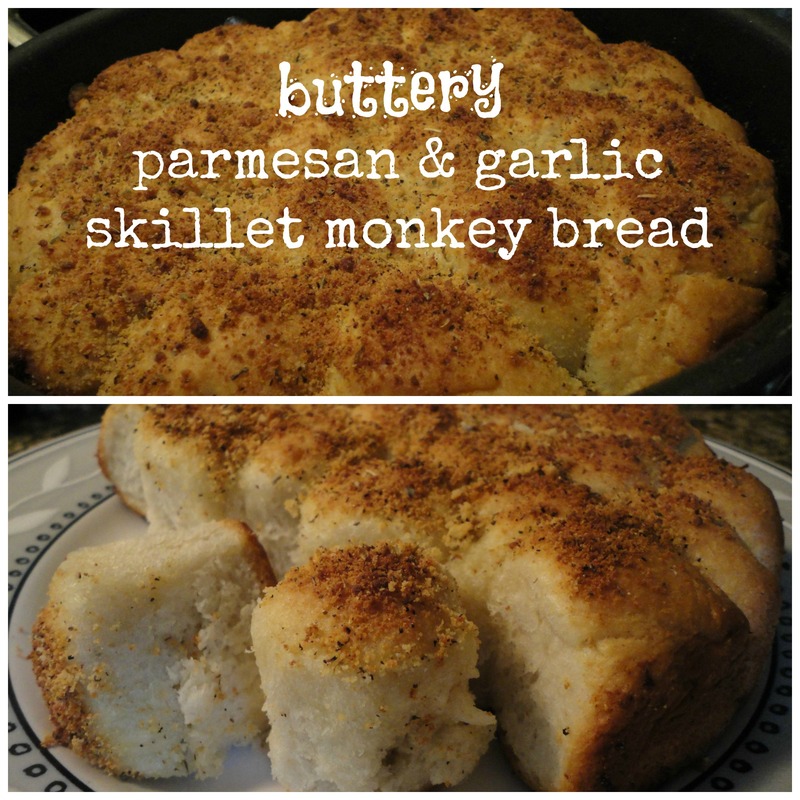 I’m making some ragout tonight and it definitely needs some bread with it, but I wanted to do something a little fun… so why not a parmesan & garlic monkey bread? And to make life even easier you don’t need to knead it and can cook it in a skillet. Perfect! Combine the warm water, yeast and 1tsp of sugar in a bowl and set in a warm area for 15 minutes to allow the yeast to activate. The yeast should create a creamy layer above the water (called the “bloom”). In a mixing bowl combine the flour, salt and 1tbsp of sugar. Add the yeast/water mixture and begin mixing on low, using a dough hook attachment, and slowly add 1/2c of melted butter. Mix for 3 minutes… The dough should be wet and tacky, if it is not add another tablespoon or two of warm water and mix for an additional 1 minute. Stop mixing the dough and allow it to rest for 5 minutes. This gives the gluten a chance to relax and spread back throughout the dough. Once rested, mix for an additional 3 minutes at medium speed. The dough should have pulled from the sides of the bowl and be slightly elastic. Lightly grease a 10″ skillet with oil, butter or cooking spray (preferably one of the first two). Using your hands roll the dough into 1″ balls and layer in the skillet. Cover and place in a warm, draft free place until the dough doubles in size, approximately one hour. Brush the dough with 3tbsp of melted butter and bake covered for 25 minutes at 400F. Remove from the oven and brush with another 3tbsp of melted butter, then evenly coat with the parmesan, garlic powder, black pepper and oregano, then bake uncovered for an additional 10 minutes. Remove from the oven and allow to cool at room temperature for at least 10 minutes before serving. That’s it, you’re done… Tasty, easy, addictive little chunks of bread goodness ready to be devoured. Serve them as a side to your dinner, as a snack, even have ’em with some dip. Go crazy! Tags: baking, bread, cooking, food, game day, garlic, monkey bread, parmesan, perfect pairings, perfect pairings at home, skillet bread, snacks. Bookmark the permalink.